increase (or decrease) the amount of DNA in the genome of the cell, and if the cell is the precursor of a gamete, in the genomes of any descendants. These mobile segments of DNA are sometimes called “Jumping genes” or “Mobile DNA“. Class II transposons. These consist of DNA that moves directly from place to place. use reverse transcriptase to make a DNA copy of the RNA to insert in a new location. 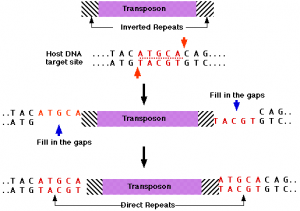 Class II transposons move by a “cut and paste” process: the transposon is cut out of its location (like command/control-X on your computer) and inserted into a new location (command/control-V). This process requires an enzyme — a transposase — that is encoded within some of these transposons. both ends of the transposon, which consist of inverted repeats; that is, identical sequences reading in opposite directions. a sequence of DNA that makes up the target site. 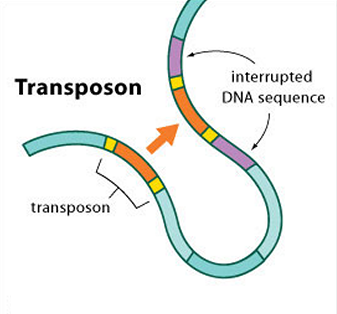 Some transposases require a specific sequence as their target site; others can insert the transposon anywhere in the genome. The DNA at the target site is cut in an offset manner (like the “sticky ends” produced by some restriction enzymes. After the transposon is ligated to the host DNA, the gaps are filled in by Watson-Crick base pairing. This creates identical direct repeats at each end of the transposon. Often transposons lose their gene for transposase. But as long as somewhere in the cell there is a transposon that can synthesize the enzyme, their inverted repeats are recognized and they, too, can be moved to a new location. There are over 100,000 MITEs in the rice genome (representing some 6% of the total genome). Some of the mutations found in certain strains of rice are caused by the insertion of a MITE in the gene. MITEs have also been found in the genomes of humans, Xenopus, and apples. Some of the mutations (c, bz) used as examples of how gene loci are mapped on the chromosome were caused by transposons. It took about 40 years for other scientists to fully appreciate the significance of Barbara McClintock’s discoveries. She was finally awarded a Nobel Prize in 1983. P-elements are Class II transposons found in Drosophila. They do little harm because expression of their transposase gene is usually repressed. However, when male flies with P elements mate with female flies lacking them, the transposase becomes active in the germ line producing so many mutations that their offspring are sterile. In nature this is no longer a problem. P elements seem to have first appeared in Drosophila melanogaster about 50 years ago. Since then, they have spread through every population of the species. Today flies lacking P elements can only be found in old strains maintained in the laboratory. P elements have provided valuable tools for Drosophila geneticists. Transgenic flies containing any desired gene can be produced by injecting the early embryo with an engineered P element containing that gene. Other transposons are being studied for their ability to create transgenic insects of agricultural and public health importance. Some transposons in bacteria carry — in addition to the gene for transposase — genes for one or more (usually more) proteins imparting resistance to antibiotics. When such a transposon is incorporated in a plasmid, it can leave the host cell and move to another. This is the way that the alarming phenomenon of multidrug antibiotic resistance spreads so rapidly. Transposition in these cases occurs by a “copy and paste” (command/control-C -> command/control-V) mechanism. This requires an additional enzyme — a resolvase — that is also encoded in the transposon itself. The original transposon remains at the original site while its copy is inserted at a new site. Retrotransposons also move by a “copy and paste” mechanism but in contrast to the transposons described above, the copy is made of RNA, not DNA. The RNA copies are then transcribed back into DNA — using a reverse transcriptase — and these are inserted into new locations in the genome. Many retrotransposons have long terminal repeats (LTRs) at their ends that may contain over 1000 base pairs in each. Like DNA transposons, retrotransposons generate direct repeats at their new sites of insertion. In fact, it is the presence of these direct repeats that often is the clue that the intervening stretch of DNA arrived there by retrotransposition. Some 50% of the entire human genome consists of retrotransposons. HIV-1 — the cause of AIDS — and other human retroviruses (e.g., HTLV-1, the human T-cell leukemia/lymphoma virus) behave like retrotransposons. integrase. The integrase serves the same function as the transposases of DNA transposons. The DNA copies can be inserted anywhere in the genome. Molecules of both enzymes are incorporated in the virus particle. The human genome contains some 868,000 LINEs (representing ~17% of the genome). Most of these belong to a family called LINE-1 (L1). These L1 elements are DNA sequences that range in length from a few hundred to as many as 9,000 base pairs. 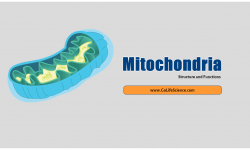 Only about 50 L1 elements are functional “genes”; that is, can be transcribed and translated. reverse transcriptase that makes a DNA copy of an RNA transcript. The endonuclease cuts a strand of “target” DNA, often in the intron of a gene. Through this copy-paste mechanism, the number of LINEs can increase in the genome. The diversity of LINEs between individual human genomes make them useful markers for DNA “fingerprinting”. Transcription of an active L1 element sometimes continues downstream into additional DNA producing a longer transposed element. Reverse transcription of L1 RNA often concludes prematurely and produces a shortened transposed element. While L1 elements are not functional, they may play a role in regulating the efficiency of transcription of the gene in which they reside. Occasionally, L1 activity makes and inserts a copy of a cellular mRNA (thus a natural cDNA). Lacking introns as well as the necessary control elements like promoters, these genes are not expressed. They represent one category of pseudogene. SINEs are short DNA sequences (100–400 base pairs) that represent reverse-transcribed RNA molecules originally transcribed by RNA polymerase III; that is, molecules of tRNA, 5S rRNA, and some other small nuclear RNAs. The most abundant SINEs are the Alu elements. There are over one million copies in the human genome (representing 10.6% of our total DNA). Alu elements consist of a sequence of 300 base pairs containing a site that is recognized by the restriction enzyme AluI. They appear to be reverse transcripts of 7S RNA, part of the signal recognition particle. Most SINEs do not encode any functional molecules and depend on the machinery of active L1 elements to be transposed; that is, copied and pasted in new locations. If a transposon inserts itself into a functional gene, it will probably damage it. Insertion into exons, introns, and even into DNA flanking the genes (which may contain promoters and enhancers) can destroy or alter the gene’s activity. Faulty repair of the gap left at the old site (in cut and paste transposition) can lead to mutation there. The presence of a string of identical repeated sequences presents a problem for precise pairing during meiosis. How is the third, say, of a string of five Alu sequences on the “invading strand” of one chromatid going to ensure that it pairs with the third sequence in the other strand? If it accidentally pairs with one of the other Alu sequences, the result will be an unequal crossover — one of the commonest causes of duplications. They have been called “junk” DNA and “selfish” DNA. “junk” because there is no obvious benefit to their host. Because of the sequence similarities of all the LINEs and SINEs, they also make up a large portion of the “repetitive DNA” of the cell. Retrotransposons cannot be so selfish that they reduce the survival of their host. Perhaps, they even confer some benefit. Retrotransposons often carry some additional sequences at their 3′ end as they insert into a new location. Perhaps these occasionally create new combinations of exons, promoters, and enhancers that benefit the host. The genome of Arabidopsis thaliana contains ~1.2 x 108 base pairs (bp) of DNA. About 14% of this consists of transposons; the rest functional genes (about 28,000 of them). Most of the 2.5 x 1011 bp of DNA in the genome of Psilotum nudum is presumably “junk” DNA.